Getting recognition for your photographic work upon completing your studies is vital in order to make the move into the professional world. The Association Of Photographers Student Awards were established in 1981, to recognise and highlight emerging photographic talent which existed in further education institutions. They are regarded as one of the premiere photographic competitions for students around the UK attracting over 2,000 entries every year. The winner of the AOP Student Photographer of the Year award for 2010 will receive: A double page spread in the AOP Photographers Awards book, a full day's work experience with a high-profile AOP member, plus extensive press coverage and AOP may use the winning images to promote the AOP Student Awards. AOP also runs competitions for professional photographers and photographic assistants. In addition, their AOP Open Awards is a photographic competition open to everyone. From professional photographers to occasional snappers, this is the competition where everyone competes on a level playing field. This year Fujifilm Student Awards are celebrating their 25th anniversary. The closing date for 2010 competition is 28th February 2010. All images must be taken on Fujifilm Professional film and no digital images are allowed, entry is free of charge and submissions are unlimited. The overall winner of the 2010 Fujifilm Student Awards will have their photograph printed on the front cover of the next edition of Flann O'Brien's 'At Swim-Two-Birds' book, published by Penguin. They will also receive a library of 25 Penguin Classics titles, £250 worth of Fujifilm Professional film, and a fantastic printing prize package courtesy of their exhibition sponsors, Genesis Imaging. The RPS awards are offered annually to individuals who have made significant contributions to the art and science of photography. The Society has adopted a wide definition of photography which refers to the art and science of the recording of light or other radiation on any medium on which an image is produced or from which any image may by any means be produced. Photo District News has variety of contests as well as one specifically dedicated to Students - PDNedu Student Photo Contest 2010 with deadline 9th December 2009. Remember that these awards are annual events and you can enter on an ongoing basis. In this respect, if this years competitions are completed, put your efforts into submitting strong entries for the next year. There are many other awards/competitions out there so always be on the look out for outlets for getting recognition for your photographic work. Having success in photographic awards gives you on one hand the confidence to approach photographers as they might have seen your work in the press as well as helps you to add some quality work to your photographic book. Making your way in the field of professional photography is not just about having great images on your web gallery, but it is about getting recognition for your photographic work, how to deal with clients and art buyers, and how to prepare and present estimates. 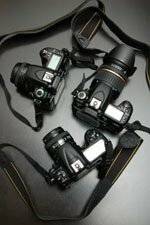 Keep checking for updates on the Digital Photography Articles section for latest additions and developments in these areas.